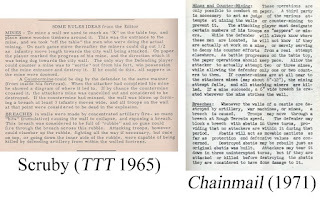 It is no exaggeration to say that Greg Bell was effectively the first staff artist of Tactical Studies Rules. 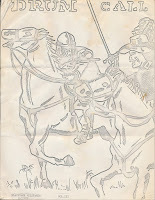 Not only did he famously draw the cover of the Dungeons & Dragons box set, as well as around twenty-five more internal illustrations, but he illustrated the company's first release, Cavaliers and Roundheads (1973), as well as key titles like Warriors of Mars (1974). Though he was never formally on staff at TSR, his fingerprints are all over their earliest work. 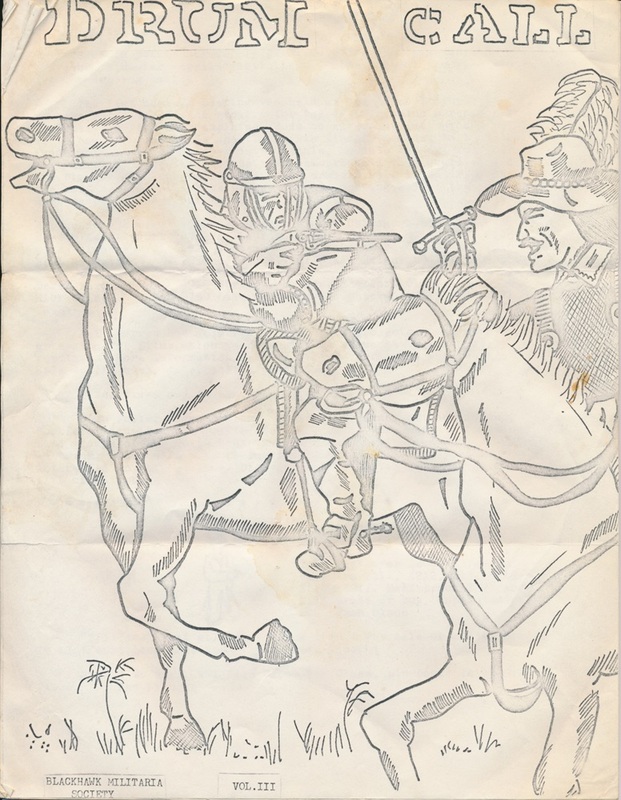 Which is why it is so interesting to peer back in time a little before TSR, when he was drawing covers like the one above for the fanzine Drum Call of the "Blackhawk Militaria Society," a group in Rockford, IL. Before any daring cartographer mapped underground dungeons in pursuit of fantastic adventure, Chainmail described a system for subterranean tunnels on paper. 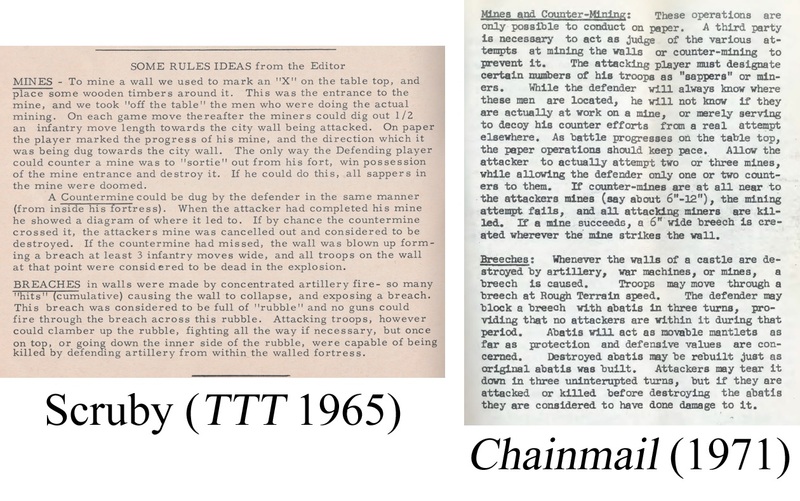 It needed these rules to simulate the discipline of the mines, a siege operation that involved tunneling under castle walls in order to, well, undermine them, destabilizing the walls to the point of collapse, after which invading troops could surge through the breach and storm the castle. These rules were a fairly late addition to the medieval system practiced in Lake Geneva, and they likely owe a debt to an earlier system blurb that Jack Scruby appended to Newell Chamberlin's rules in a 1965 issue of Table Top Talk. Old school Dungeons & Dragons fans know that Greg Bell's beloved lizardman from the inside cover of Greyhawk (1975) served as the logo of TSR Hobbies up until it was replaced by the wizard logo in 1978. But when you get out a magnifying glass and take a closer look at the miniaturized lizardmen on TSR products, especially toward the end of those three years, you might spot a doppelganger at work. "A must-read for gaming geeks." "Highly recommended for role-playing game enthusiasts." "If you are a roleplayer, or a gaming historian, or a fan of D&D, you have to read this book. That simple." "The first serious history of the development of Dungeons & Dragons... there's much here to fascinate even readers with only a cursory interest in the game." "If... you want the most comprehensive look at the origins of the wargaming hobby and a painstakingly researched look at the formation and early years of TSR and the original Dungeons & Dragons game, then you will never need to read another book." "Playing the World is a must for gaming and popular culture history collections." "For game scholars... this book is a must-read. Even at its most dense and arcane, the book is fascinating, and Peterson's dry wit makes it all the more enjoyable." "Read Playing at the World. It's the deepest, most thorough, most revealing book about the evolution of D&D that you'll ever read, and probably that will ever be written." "Here's how good this book is. Peterson's book is 720 pages, and while I was reading it, I was constantly wishing it was longer." "A thoughtful, erudite, yet highly readable book that should be viewed as a seminal contribution to the history of an important gaming genre." "The most carefully researched, loving and impeccably documented history of Dungeons & Dragons we are surely ever going to see... a simultaneously indulgent and authoritative book our world would be a dimmer place without." "Playing at the World (2012) chronicles to incredible, unprecedented detail the early days of how Dungeons & Dragons came to be." "This is going to sound like hyperbole, but it's not. Jon Peterson's 'Playing at the World' is literally the best book ever written about D&D." "No-one else is likely to write a book about the development of roleplaying that will ever match the scope and depth of this book." "Playing at the World is a triumph." An author investigating the history of wargames and role-playing games. Reach me at jon at unreason com. "Jon Peterson is the 'Real World' equivalent of a Sage as hired to aid spell research by Tenser in the Greyhawk campaign.... He never stops digging up wonderful material." Watch Jon discuss the early history of gaming on PBS Off Book. Listen to Jon on the Save or Die! Podcast Episode #78 discussing Eldritch Wizardry. Listen to the Sometime Seminar podcast Episode #15 for a detailed critical discussion of Playing at the World.